As women all around the world know, bikini line hair removal can be a sensitive subject, both for your skin and for your confidence. We suffer from stubble, razor burn, ingrown hairs, rashes, and countless other issues as a result of the pursuit of a smooth bikini line. An unsightly bikini line can ruin a beautiful beach day as well as cause unnecessary embarrassment in more intimate situations. There is a myriad of solutions available to us today from waxing to epilation to going natural. However, for those of you who long for a painless, cost effective, and quick solution, bikini shavers are the answer to all of your bikini line woes. Electric: Electric bikini shavers remove body hair using battery-powered, moving blades. Different shavers and attachments feature blades that come in different shapes, sizes, and movement patterns to achieve the best possible shave for your needs. 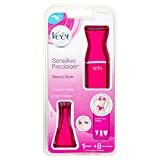 These are ideal for women who want to achieve quick results and wish to shave their hair to different lengths in different areas. Manual: Manual bikini shavers remove hair through stationary blades that are moved by hand along the skin. They function like a normal razor but are shaped and sized specifically to the bikini area. As they do not require a battery or electricity connection, they are ideal for situations where electricity access may be limited, like during outdoor trips. Trimmer versus Shaver: It is important to distinguish between products that are labeled as “trimmers” versus “shavers” in order to purchase the best device for your needs. Trimmers and body groomers are intended to neaten up hair grown and to keep it at a shorter, more manageable length. Many women prefer these as they do not wish to be completely clean-shaven and trimming often helps to avoid razor burn and ingrown hairs. On the other hand, shavers are used for a closer shave that leaves the skin completely smooth and soft. These are often ideal for armpits and the bikini line itself, as well as for women who prefer to be completely bald down south. Many electric bikini shavers come with attachments for both uses. Consider your needs and desires when deciding between a “trimmer” and “shaver”. Minimal Repetition: Highly satisfied customers were especially impressed with shavers that did not require them to go over the same spot multiple times in order to achieve a close shave. For those of you who fallen victim to razor burn and ingrown hairs, you are well aware of the benefits of minimizing how many times you go over the same spot. Attachments: The top-rated bikini shavers come with a variety of attachments. 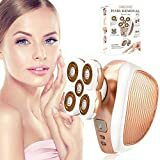 Depending on the coarseness of hair, tightness of skin, the curvature of an area on the body, and desire for precise hair removal, different heads can be used at different times. 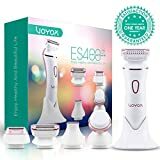 Shavers that offered different head options that allowed users to achieve a comfortable, efficient, and successful shave in various places received the best reviews. Wet/Dry: Users who purchased bikini shavers that offered both wet and dry options were the most satisfied. Women were grateful for the option for a quick, mess-free, dry shave as well as the ability to shave during their normal shower routine. Battery Life: Battery life was rated time and time again as an important feature for bikini shavers. 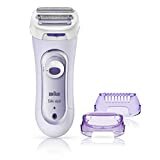 Reviewers loved that they were able to use their bikini shaver multiple times without having to worry about it running out of battery too quickly. Wet/Dry: Some bikini shavers can be used both with and without water. The ability to dry shave is appealing to many people for a number of reasons. Whether you’re in a hurry or you realize too late that you missed a spot shaving, it can be a hassle to strip down and lather up in the shower. Dry shaving without damaging your skin is an excellent solution for those who wish to avoid the mess and hassle of water and shaving cream. These shavers can also help cut down on water waste! Noise: Top rated bikini shavers are very low on noise emissions. 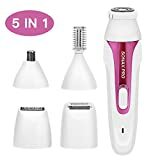 If you share your household with a roommate or partner and wish to keep your hair removal process private, it would be prudent to look over reviews to determine which shaver is quiet enough for your needs. While a manual shaver may be the only completely noise-free option, there are many electric shavers that produce minimal noise. 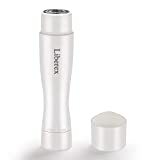 Battery Life: Long battery life is important, especially if you will be using your bikini shaver frequently. Most shavers provide for 10 or more hours of in-use time. 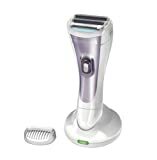 Rotary: Rotary shavers use spinning, circular blades to capture hairs in openings in the heads. The circular motion makes it easier to move around difficult areas. Rotary shavers are best for those who do not shave as often, as they are most effective on longer, stronger hairs. Foil: Shavers that use foil have a thin layer of metal covering the long, straight blade and are good for sensitive skin. Foil captures hair in slots that offer a closer shave than rotary blades. They are especially good for straight edges, given the nature of their shape, and are perfect for those who shave every day. Number of blades: The more blades on any given razor head, the closer, faster, and more effective your shave will be. Depending on how close you wish to shave, consider the different numbers of blades available on different attachments. Size: Many shavers come with various head sizes to allow for more effective and efficient shaving in different areas. If you would like a precise and comfortable shave and intend to use your shaver in a number of different areas on your body, choose a shaver that comes with multiple attachment heads. Epilating Capability: Although more painful than shaving, many women prefer epilation as it produces results that are similar to waxing. Epilation rips the hair out from the root, leading to both minimized and slowed regrowth. 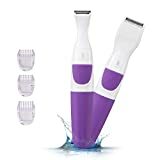 Some of the most highly rated bikini shavers come with an epilating head in addition to shaving and/or trimming heads. 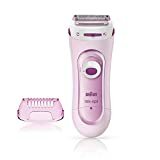 If you prefer epilation for all of your hair removal needs, want it for certain areas, or are interesting in trying it out for the first time, purchasing a bikini shaver with an epilating head is an excellent call. Extras: Many bikini shavers come with fun add-ons and accessories. Some include an exfoliating head or exfoliating gloves. Exfoliating before hair removal can prevent and reduce ingrown hairs. Other shavers come with a shower hook for your device, which can be very helpful for in-shower use. Tweezers for stubborn, stray hairs, carrying cases for attachments, and storage boxes are other extras that may be included. Although these accessories are by no means necessary to effective bikini hair removal, they can be fun and useful additions to your purchase. Panasonic: Panasonic was founded almost a century ago and is one of the largest product manufacturers in the world, made up of 473 companies and employing over 260,000 people. Panasonic researches, develops, and distributes solutions for home, work, and travel. Philips: Philips began as a family business in the Netherlands, selling incandescent lamps and other electrical products. They have since grown into a multinational, diversified technology company specializing in healthcare, consumer lifestyle, and lighting. Conair: Founded in 1959, Conair is a US-based multinational corporation that sells small appliances, personal care products, and health and beauty products. They are focused on innovative and technologically advanced product development.